SUBMISSIONS WINDOW FOR UFO 7 ARE OPEN APRIL 1, 2018 – APRIL 30 2018. Please read the guidelines carefully before submitting your story! Puns and stories that are little more than vehicles for delivering a punch line at the end aren’t likely to win us over. The best way to learn what we like in general is to read a previous volume. You can buy it here and also read the online stories for free. I have two 6100-word horror stories that were previously printed and are now on submission at several magazines. Can I send them to you, simultaneously? Please don’t. We have carefully considered what we’re looking for and expressed it above. If you strongly feel the need to break one of the guidelines, query first and provide a good reason. My story was previously published in an obscure college anthology in 1996, which sold 16 copies. Can I submit it? Sorry, but we won’t consider unsolicited reprints, no matter how obscure. I may have accidentally begun my manuscript three double spaces below the byline instead of two. Am I getting auto-rejected? Don’t sweat the small stuff. We’ll reformat your submission to fit our needs. You’re even welcome to send your story handwritten in pink crayon on glitter-sprinkled construction paper, but we will take that into consideration when deciding whether to purchase it, and whether to file for a restraining order. I plan on winning multiple awards for my UFO story. Will your exclusivity rights prevent me from being included in the Nebula Showcase? Congratulations on all your future success. We will gladly grant exceptions for “Best Of” anthologies. An anthology of humor SF/F is the greatest idea since sliced bread. What can I do to help? Spread the word. Support our Kickstarter campaign. Pick up copies of previous UFO volumes. If you want to invite our authors/editors to a con you’re organizing, sell paperback copies of UFO at your store, bake us cookies, or help in any other way, we’d love to hear from you. Please report your submission stats at The Grinder. 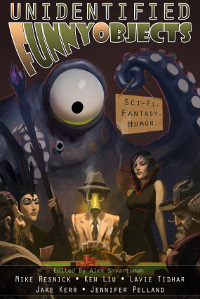 Unidentified Funny Objects anthologies are a SFWA-qualifying market.